Akrapovic have released a new GP-styled slip-on for the new 2017 Honda Fireblade. This titanium slip on is extremely easy to fit and fully road legal, which means you can make your new Blade look and sound even better without complicated modifications, or running the risk of upsetting PC Plod. Not only that, but the Slovenian exhaust supremos are also offering optional stainless steel (£851) or titanium (£1465) header sets, designed to upgrade the slip-on kit to a full system. 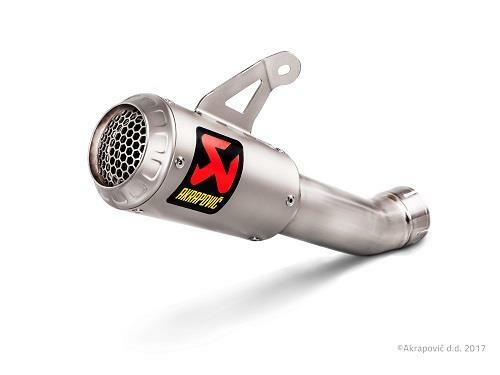 Akra haven’t announced any performance claims for the system yet, but you can bet your bottom dollar it’ll make the Blade beefier throughout the rev range as well as a bit lighter on the scales, too. It comes with a suggested retail price of £630, which may sound a little steep. But it seems to be the norm now with most aftermarket systems and silencers, especially one that uses such high-quality materials and build quality as this.